Special effects in photography tend to be a mixed bag. It can be difficult to create realistic-looking effects, much less effects that look like they were made in-camera, instead of through a digital editing process. Tilt-shift editing is an example of a process that produces images that look radically different from their originals, yet could still conceivably have been made without a computer. 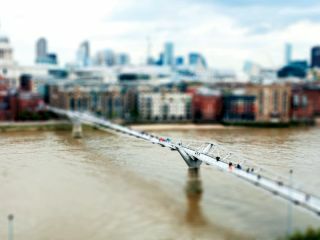 Tilt-shift has its roots in architectural and landscape photography, but in photographic communities, it has become a by-word for a style of photography that makes its subjects look like toys. Tilt-shift photography is beloved by its practitioners, partly because it offers a fresh new perspective on old and familiar scenes; it's difficult not to fall in love, for example, with an image of a favourite destination when it looks like it should be inhabited by Noddy and Big Ears. Faking a tilt-shift image also takes mere seconds once you've got the hang of it, and can even be automated entirely, to the point that some compact cameras and even a few DSLRs come with the ability to miniaturise shots without the help of a computer. For everyone else, creating miniature photos is a doddle, but as with producing any decent image, a little forethought and effort are required to achieve a good result. Read on to find out exactly how it's done. With the digital process taking a short time, choosing your shot is the most crucial aspect of creating a rewarding and convincing tilt-shift photo. The best ones work if you imagine that you're trying to create an image of a small-scale model city. That means you need to imagine the angle from which you might shoot if you were standing over such a model - not directly down, but not directly at the scene, either. A relatively shallow angle will help with realism - think pedestrian bridges or low-rising hills. Be mindful of exactly what you choose to shoot as well. It's possible to create a convincing tilt-shift image that includes people, but it's trickier to get right than shots of vehicles, for example. If the people in your shot are too detailed, you'll lose the air of a Hornby-style model, so try to capture people from a long way away - go for rough shapes rather than facial features. Alternatively, objects that make popular toys are a good bet: construction equipment, trains and aircraft are all good potential ideas. These are quite specific rules, but toy-style processing won't work very well unless you follow them - standard architectural shots and everyday portraits are likely to be poor candidates. If nothing else, this is a great excuse for you to grab your camera and get shooting some new subjects. As ever, if you have access to the full version of Photoshop, you're laughing - you've got all the tools you need to create repeatable, convincing miniatures, and once you've practised doing it a few times you'll be able to get the job done in a few seconds. Those unwilling to splash out nearly £700 on Photoshop CS5 need to get a little more creative. For example, it's possible to achieve the same result using Photoshop Elements, albeit with a few restrictions. For the best effect, you'll want to use a graduated mask, which you can't do in Elements. To get around this restriction, we'll use GIMP, which has more or less the same range of editing tools as Photoshop, and is free, although its interface is a little less intuitive than Adobe's. There's bad news if you'd prefer to stick with album-slash-editors like Google Picasa. Despite tilt-shift's popularity as an effect, it isn't available as a one-click option in many applications. You can knock up quick and dirty tilt-shift style images online, using a service like www.tiltshiftmaker.com, which lets you upload your images. You can then apply an automated tilt-shift effect before downloading the finished result, although high-resolution images attract a charge of around 10 pence.